Are you stressing over what to serve at your holiday meal now that many traditional dishes are off limits? No need to worry because many recipes come in a low carb version. I’m the youngest of six kids and times were tough growing up. My father was in the Navy while my mother stayed home The Navy pay was barely enough to support such a large family. Our holiday meals were very modest. In fact, I remember having whole chicken rather than turkey on Thanksgiving. And, there was rarely any leftovers. We also didn’t get together with other family on the holidays as they lived too far and it was tough to travel with so many kids in tow. So, the big Thanksgiving dinners didn’t start until I was an adult. During one of our family Thanksgiving meals, I remember my oldest sister bringing a sweet potato casserole. I thought it was strange to add marshmallows to a side dish. When I got my first taste of this , I thought it belonged on the dessert table. Apparently, a candy company who wanted to market their marshmallows as an everyday ingredient and the recipe went viral. For my low carb sweet potato casserole, I left out the marshmallow taste as I never liked them on the dish. Instead, I’ve topped the casserole with a sweet pecan topping. I also don’t use real sweet potatoes because they have about 25 grams of carbs per cup. Instead, I’ve mashed together cauliflower and pumpkin to mimic the sweet potato taste. 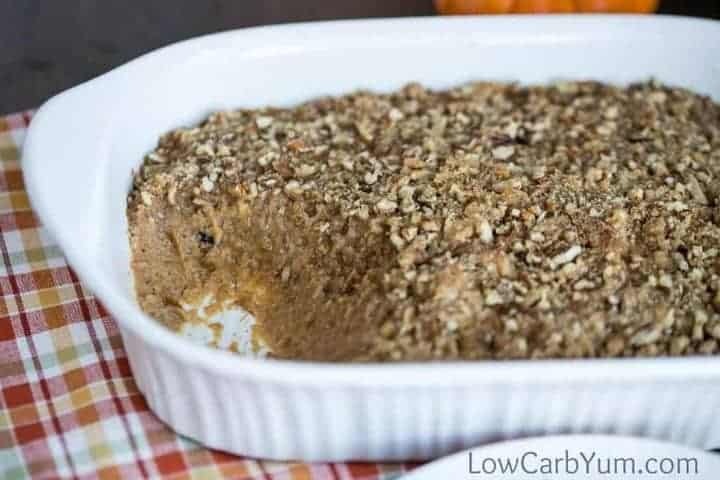 The idea for using cauliflower and pumpkin in a low carb sweet potato casserole isn’t new. 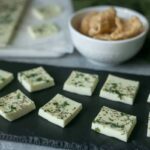 It likely came from Maria Emmerich who is the best selling author of The Ketogenic Cookbook. 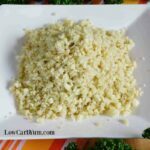 It makes sense to use cauliflower as it’s been the most popular ingredient for low carb potatoes. But, to get the flavor of sweet potatoes, you need to add a bit more. Pumpkin is very close in taste to sweet potatoes but isn’t as sweet. That’s why you’ll need to add a sweetener to get the true flavor. I added a half cup of Sukrin:1 to the cauliflower mixture the first time I made the casserole, but thought that was too sweet. So, I’ve lowered the amount to 1/3 cup. If you’d like to cut back on the erythritol, you can use plain stevia instead of Sukrin:1 which is a stevia blend. I’ve included the amount of SweetLeaf drops needed. The pecan topping adds more sweetness. I wanted the flavor of brown sugar so I mixed in Sukrin Gold with the chopped pecans. 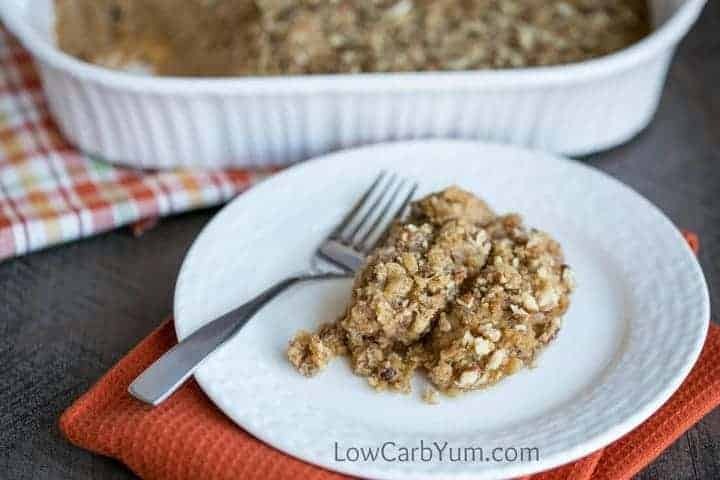 If you don’t have any low carb brown sugar substitute on hand, you can always add a touch of blackstrap molasses to a granular white sugar substitute. The traditional pumpkin spices of cinnamon, nutmeg, ginger, and cloves really enhances the flavor as well. However, you can change up the spice blend to suit your own tastes. 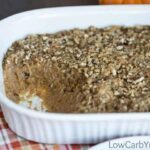 This low carb sweet potato casserole tastes more like a dessert to me, but it does go well with turkey and ham. So, it’s a great dish to make for your holiday meal. This year, my oldest sister, the one who introduced me to the marshmallow topped holiday side dish, has gone low carb. 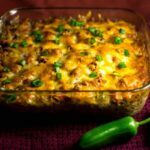 I plan to bring to introduce her to my low carb version of the casserole at our family Christmas dinner. 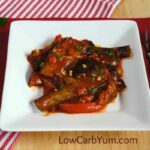 Need some more ideas for low carb holiday side dishes? 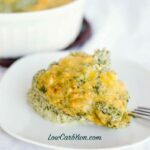 My cauliflower au gratin is always a hit and so is my creamed spinach. 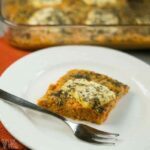 What are your favorite low carb recipes to serve at holiday dinners? I’d love to hear about them in the comments. 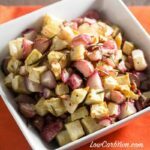 Staying away from sweet potatoes due to carbs? 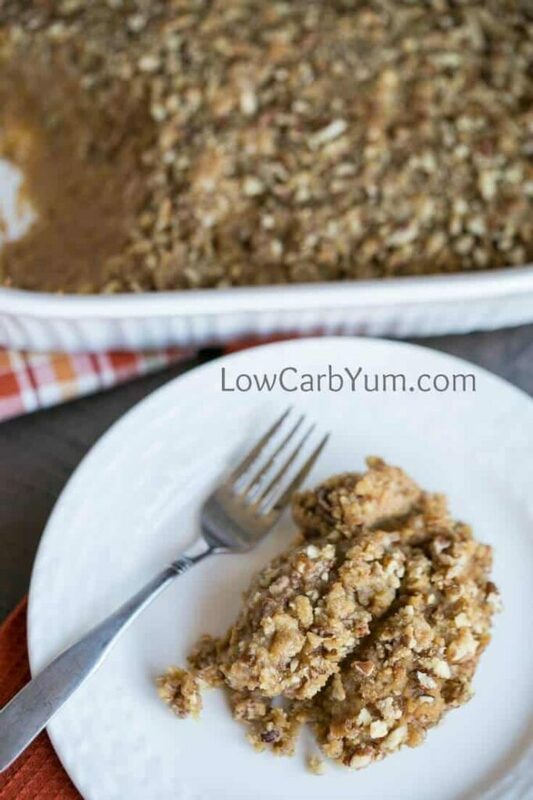 Try this fantastic low carb sweet potato casserole with pecan topping. It's perfect for the holidays. 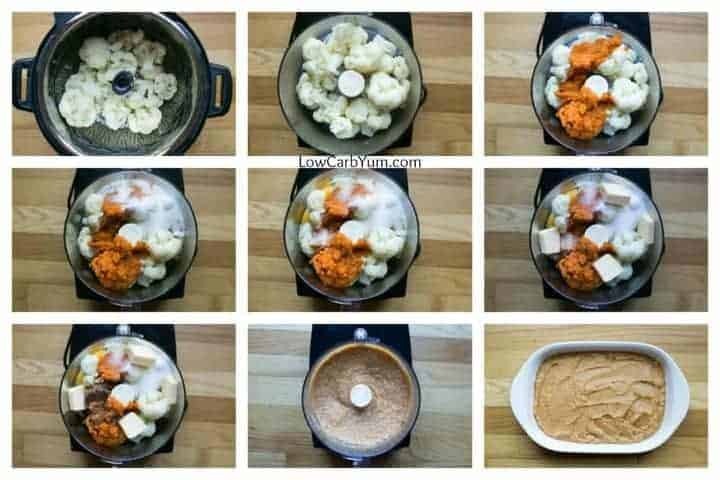 Combine steamed cauliflower, pumpkin, sweetener, eggs, salt, butter, cinnamon, nutmeg, ginger, and cloves in food processor or blend. Puree until smooth. 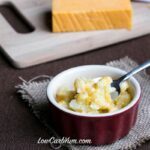 Spread mashed cauliflower mixture into a 2-quart or 11x17 casserole dish. In medium bowl, mix together Sukrin Gold, coconut flour, and almond flour. Cut in butter then stir in pecans. Sprinkle pecan mixture over cauliflower mixture. Bake at 325°F for 30 minutes or until topping has browned. Has anyone’s tried making this the day before and reheating? Trying to save time tomorrow. But i know cauliflower gets a stronger flavor when it is leftover. I don’t want the cauliflower flavor to take over the dish. I’ve made it before and reheated in a low temp oven. Have yyou tried freezing this after baking, or perhaps just the puree for future use? I haven’t, but it should freeze well as the puree freezes well. Could I use just a regular granular sweetener like pyure instead of gold, I can’t find any low carb brown sugar in my area. You can. Or, you can make your own brown sweetener with a touch of blackstrap molasses. Just wondering it says to use almond and coconut flour . Can you use just one or the other? What is the difference between the 2 other than the obvious? 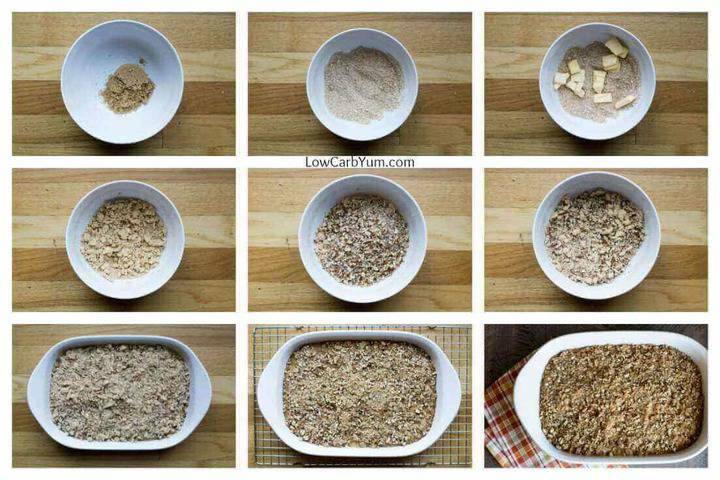 I like to use a mixture of the two, but all almond flour is okay too. 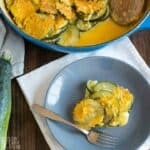 I subbed baked acorn squash for the cauli and it was delicious!! Perfect for Thanksgiving. Thank you so much! I’ve never had acorn squash. Maybe I need to pick some up next time I’m at the grocery store. When she says mock that means fake, usually when people use the word “mock”, it means there may not be any of the original ingredient in it! It’s like when people say mock macaroni and cheese, and there’s no macaroni in it, probably cauliflower instead of macaroni! Or mock meatballs, means there’s no meat, it’s a nut or legume or whatever plant based substitute someone wants to use! When the word “mock”, is used it’s generally to recreate a healthier recipe, somewhat like the original! Hope that clarification helps! 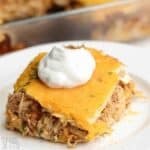 I think the OP meant that the title of the post was misleading because it did not have the word mock in it when this is clearly a mock recipe. I was a bit thrown off as well, this is not what I was looking for. By the way, why all the exclamation points, Anne? It makes it seem like you’re shouting. This looks awesome! In my household, we always made a brown sugar/strusel type topping for the casserole, never marshmallows. I actually really like marshmallows, but I don’t care for them in that one instance. 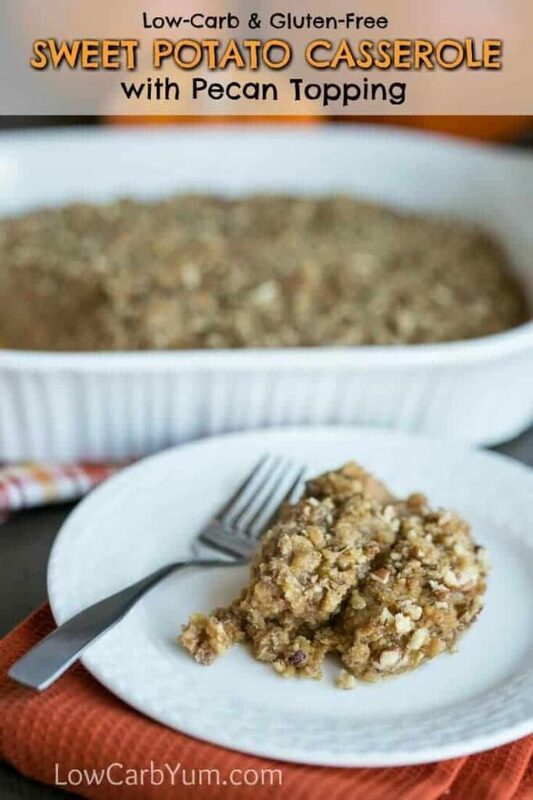 A brown sugar topping is ideal in my book and this looks like a great substitute! Sukrin Gold is the best low carb brown sugar sub I’ve found. I added vanilla and it tasted good by itself without the topping!! Not much of a clove fan so I left that out. I also added a little more cinnamon and sweetener. I can’t believe how good this is! Thanks!! Ooh! I think I’ll try it that way. Sounds yummy! Thanks for much needed recipes! I will definitely try this at Christmas! It’s perfect for Christmas dinner! This sounds so good! And veggies! I really didn’t taste like veggies to me. Hello, I stumbled across your mock sweet potato receipt searching for a topping for the real McCoy…they are both cooking side by side in the oven…the mock is better then the real, so excited to take both dishes to my mom’s today, see which one everyone eats the most of. Low Carb for Thanksgiving all the way!! Thanks for giving it a try Cheryl! I decided I would make the filling, cover it with foil, and top it and bake it off on Thanksgiving Day, as a time saver. Not to be overly critical but I sure hope it tastes better after adding the topping and baking it, because right now it has very little flavor and is really bland, borderline not good. Even adding some additional spices didn’t help. Does the taste improve once baked? I sure hope so! Thanks. Mine tasted like a dessert, but that was with the topping. This looks great and I look forward to trying it. I used to make a knock off of the Boston Market Sweet Potato Casserole and it was a great hit. This looks like a pretty good imitation and I think the family will like it. Thanks! Why does it say sweet potato in the title & then call for pumpkin in the recipe? It’s a mock sweet potato pie. The instructions mention almond butter but the ingredients do not, just almond flour. Is that a mistake, or is it actually almond butter in the recipe instead of almond flour? It should be only almond flour not butter. I’ll get the instructions fixed.